Better than the pizza guy! 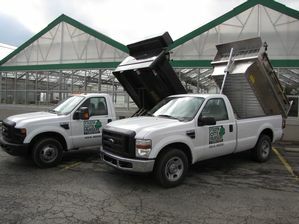 Want to get that landscape project done around the yard but don't have the ideal vehicle to transport plants and mulch. From items that are too heavy or awkward to transport in your personal vehicle to mulches and soils you simply don't want to put in your car. Frank Otte Nursery offers fast local delivery. Need mulch and need it now? No need wasting time and making several tips to the store to get enough mulch to complete your project. Simply call us and schedule a delivery over the phone! We gladly take credit card orders over the phone, sorry no cod, so you can stay at home and get the area ready for mulching. Don't know what kind of mulch you want? Just look under the Garden Products tab on the home page and select mulch to see all the varieties we carry. We deliver much more than mulch, we gladly offer delivery service for everything we sale, from our soils and decorative gravel to trees, shrubs and annual flats. That's not even the best part about our delivery service. The best part of our delivery service is the speed in which we get you your purchase. We often can get your delivery out the same day, with the exception of some busy weekends in spring, so you can get that project done and off your list. Deliver flowers, roses, perennials, and everything you need to plant them so you can create your very own garden paradise in your yard. Delivered items are placed neatly on or next to a paved surface. Delivery drivers will not drive trucks on or through the yard. Heavy items such as trees will be placed exactly where you want them in the yard. Simply make spot with a flag provided to you by the store. Bagged items will be stacked on or next to a paved surface, if excessive carrying is needed extra delivery fee may apply. Delivery fees are zip code based. For more information or any questions please call 454-4000 and speak to one of our friendly team members. Call today to schedule your delivery.